Would you like your dog to come when called? Walk nicely on a leash? Or maybe just survive your puppy without losing your mind? Zippity Do Dog can assist with many common problem areas such as barking at guests, jumping on family members, over-reacting to other dogs during walks, not coming when called, darting out the front door, and chewing illegal objects. We use science based training practices, that are ethical and humane. Because science tells us, that positive-reward based training techniques create a learning atmosphere where your dog will have fun and be eager to learn​. We develop training plans that are tailored to the needs of each individual dog, where lessons are arranged to fit your schedule. We teach both you and your dog, the skills needed to help you reach the training goals that matter the most to you, while strengthening your relationship and deepening your bond with each other. Our training methods are designed to give owners success with their goals, and relief from behavior problems. We want you to graduate with a basic understand of reward-based training and behavior modification, so you're equipped to continue your dog's education. We also specialize in more challenging issues like anxious, fearful and reactive dogs. We routinely offer training plans for dogs that struggle with aggression, leash reactivity, resource guarding, separation anxiety and phobias. We will work with veterinary behaviorists from other organizations to implement behavior plans as well. We accept all dogs, of all ages and size. We do not discriminate and welcome pit bulls and pit bull type dogs, as well as strong breed and large breed dogs. This class is for the frustrated greeter. Does your dog love other dogs, except when he's on a leash? Does your dog lunge, and pull toward other dogs or people because he wants to go say Hi? Then this class is for you. Whether you have a new puppy, or a dog who just needs some training, we can meet your needs! If you're ready to begin a new journey, we are here to help you on that path. We train the most important dog in the world, yours! 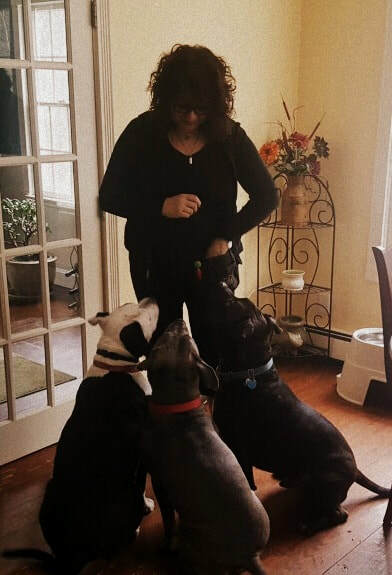 ​The Certification Council of Professional Dog Trainers,The American Veterinary Society of Animal Behavior, The American College of Veterinary Behaviorists,The International Association of Animal Behavior Consultants and Linda Michaels Hierarchy of Dog Needs. Lee believes that pet owners should have transparency when choosing a trainer, and often their websites, literature and come-ons deliberately hide their use of shock, prong and choke collars, by describing their training style as 'Balanced'. It doesn’t occur to pet owners that this harmonious word ‘balanced’ includes the use of force and pain. In an effort to end the use of frightening and painful electric shocks to train and manage animals, Lee has signed the pledge and joined the "NO Shock Coalition"
Additionally, Lee is a proud participant in Project tRade, the Pet Professional Guild's (PPG) international advocacy program that promotes the use of force-free pet training equipment by asking pet guardians to swap choke, prong and shock collars (and any other devices that are designed to change behavior through pain or fear), in exchange for discounted training services.